﻿ Best Strategy To Build On-Demand Services App For Multiple Industries! In a world where everyone is busy with tight work schedules, it’s difficult to find time to get everything we want. Before internet, smartphones and mobile apps, people had to drag themselves to different stores to purchase their desired products. But today, with the arrival of on demand apps, it has now become comparatively easier to get everything delivered on your doorstep. A taxi? The pair of shoes? Dinner for two? Now, there are on demand apps to help you get it. Such apps greatly simplify our lives, don’t they? These apps also make millions (even billions) while simplifying our lives. Take Uber for example. 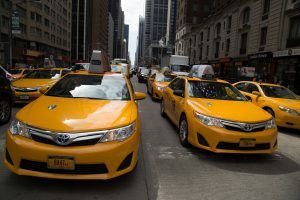 It all started with a simple idea of calling a taxi at your location via its mobile app and now, it is valued at $66 billion. Instacart, an on demand grocery delivery app, also raised a number of fundings since it started and is now valued at $3.4 billion. In fact, it’s possible to build grocery delivery apps like Instacart and establish a successful on demand startup. You can refer to our article on Instacart clone app to learn everything you need to know about Instacart and how to create an app like Instacart to disrupt grocery industry. However, let’s get back on the main subject. Before we get started, let’s first briefly understand what is an on-demand services app? This is the first and most important question and we’ll start with understanding what kind of services are provided by on demand apps, and what type of mobile apps are in this niche. First of all, these kind of services are created to make our lives easier. These apps help in emergency situations when there is no time to solve them. Generally, it works like this: the user installs an on demand app and when there is an issue that needs to be solved, user turns to the application and ta-da! Groceries are delivered, taxi is booked, dinner is on its way, and so on. Therefore, it’s clear that all successful startups built on this principle emerge in the market. Even though there is an intense competition in each industry, you can still easily find your own place in the sun. In fact, there are now a variety of life-savers that offer assistance in solving problems in almost any industry including retail, healthcare, food, beauty, and domestic services. But, if you look closely, most of these on demands apps serve only for one industry. 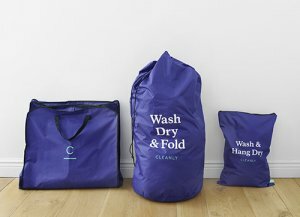 Instacart, for example, serves to people who want to order groceries at their doorstep, while Cleanly is an app to get your laundry done in 24 hours. There are only a few on demand apps that serve multiple industry. One of these apps is Jinn. It’s also an on demand services app that serves for multiple industries. It’s basically a same-hour shop on your behalf kind of delivery app that operates in U.K. While Postmates and Quiqup are its competitors, but Jinn differs from those competitors in a number of ways. 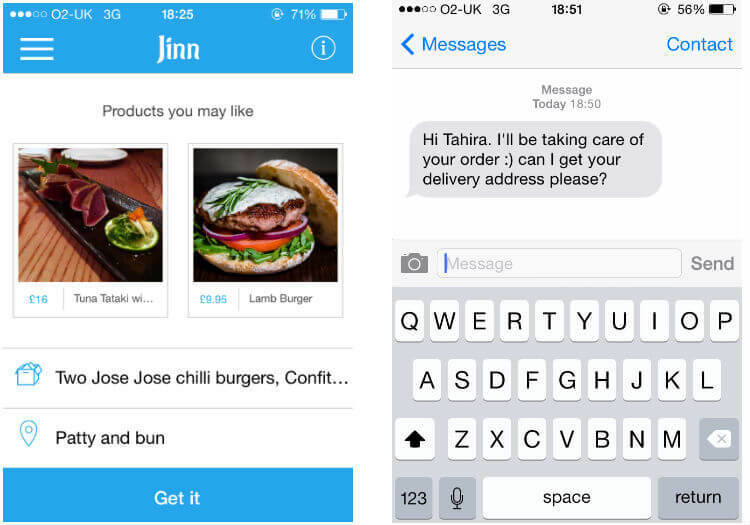 Unlike Postmates, Jinn lets you order anything locally for delivery – not just food. In Jinn, you simply browse the location-based service app for items you want to purchase, or enter your request in a free form text field, and one of startup’s self-employed courier goes to the store, purchases the product and delivers it to you. Another differentiator of Jinn app is that its service runs 24×7. In fact, the app has been a popular among students as who else is going to do that late night munchies run, right? Moreover, instead of having a catalog of products like Tok Tok Tok and Postmates does, Jinn iOS and Android app simply lets you write what you want and where you want it, making the order process as fast as possible and hassle-free and promise to deliver the product within one hour. 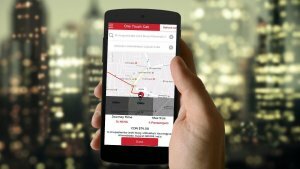 The startup’s deliveries are handled by freelance couriers, with the app assigning each order according to proximity. The startup takes a commission from the £5.95 delivery fee plus 10% of the purchase. While Jinn’s business model is quite similar to other on demand app services, but what’s different about Jinn is that they’ve successfully cracked courier recruitment, scaling and other issues by being clever about who they’re targeting. And while it’s still early days for Jinn, the on demand startup has successfully raised $10 millions in funding (20 millions in total till now). The startup’s business model is mainly focusing on official partnerships where the company now has around 1000 of these says Navarro, CEO and co-founder of Jinn. Jinn charges delivery customers a delivery fee based on distance and 10% of the price of the basket, and for partner purchases, the startup charges customers a significantly lower delivery fee and charges partners commission of 25% of the basket. In simple words, by partnering with merchants, it costs less to order via the app and Jinn generates higher commission. 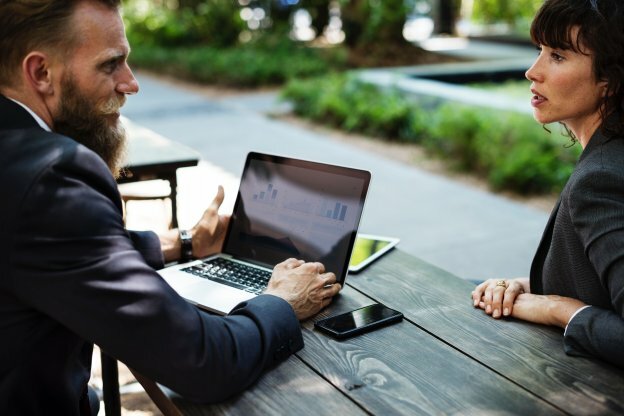 In return, partners get more customers sent their way and can integrate more fully with the app in terms of receiving orders and managing stock. Similarly, if you want to build on demand services app, but not sure which industry to target, you can sustain Jinn like business model in a particular market where competition is low and targeted audience seeking such simple services. For example, you can create a platform for people who wants to earn money by delivery products and tie-up with several locally stores and list their products on your on demand services app to earn a mutually decided commission. In addition, you can also add the feature of ordering an item that isn’t shown in the list through a text field and charge special delivery fee from customers to make a good money. With this, you can get ahead of a lot of on demand apps that is serving just one industry. For instance, if a person uses Instacart for groceries, Yelp for food, and Cleanly for laundry, you can build your on demand services app that offers all these services in just one app. For this, you can consult with a mobile app development company to help you understand how the app will work with flowcharts and use cases to finalize the app flow. Nevertheless, such app will not only be convenient for users, but it can make a huge amount of money from different type of products/services like Postmates and Jinn is doing. However, while building your on demand app, you must analyze your local competitors and make sure that your mobile app provides the services in more simple way for users to purchase products or hire other services. In case, if you still have any query or confusion regarding on-demand solutions, then you can get in touch with us through our contact us form. One of our sales representatives will revert to you within 48 hours. The consultation is absolutely free of cost. This page was last edited on September 12th, 2018, at 7:35. Have an Idea for On-Demand App? Let's Discuss!